What do you do when you have three little active boys and a sleeping baby? Break out the scissors for some snippin! 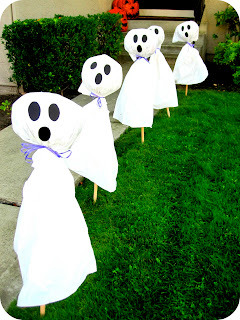 I made these little ghosties for my front lawn last night... and the boys were so excited about them that we decided to do a little ghost project while my daughter was napping this morning. Materials Needed: strips of white paper, scissors, glue sticks, googly eyes, black paper, and a white crayon. 1. 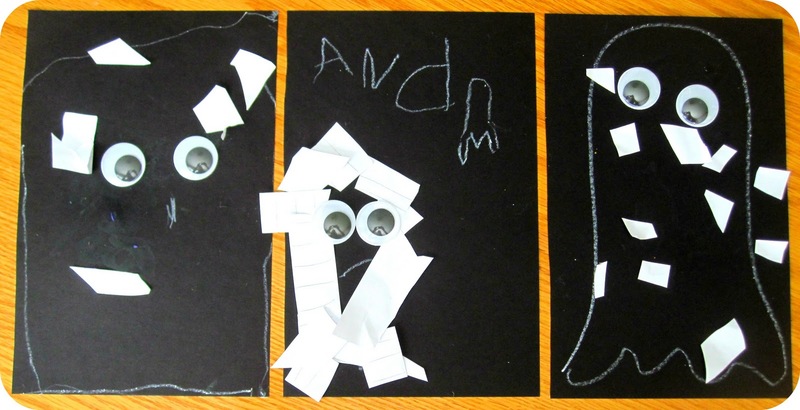 First the boys each drew their ghosts with a white crayon (one was adamant that I draw his ghost... so I obliged). 2. Next they started snippin their white strips of paper. I love the faces they make while they snip. They are so quiet and so focused. 3. Then they glued their paper onto their ghosts. I didn't tell them what to do... so they each kinda decided what they wanted to do on their own. Each ghost was different. My little guy (middle one) even tried writing his name. 4. 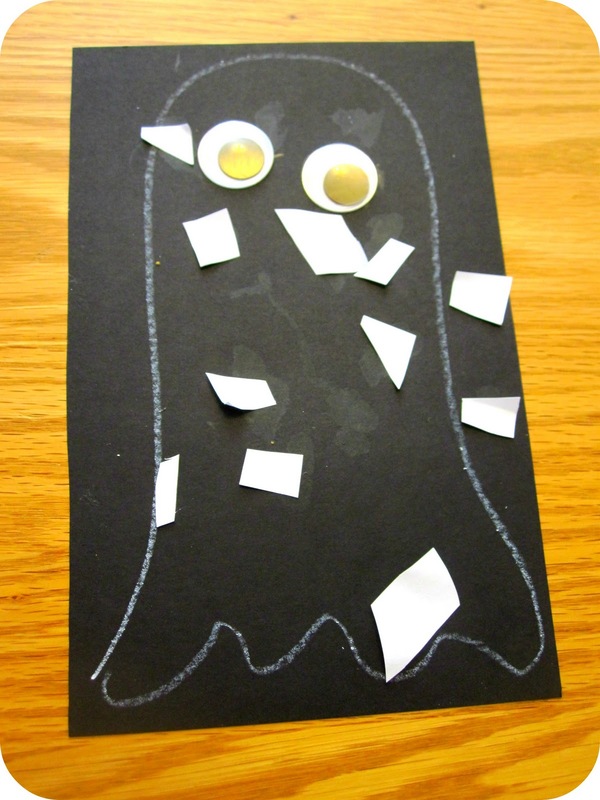 Lastly, they added googly eyes and then we let the ghosts dry. My goal for this project was to focus on the process of cutting. Focuing on the process is usually a goal... but sometimes I get caught up worrying about the product. I chatted with my son's preschool teacher about this last week and we discussed how the process is for the kids and the product is for the adults and how sometimes we like to have both :). 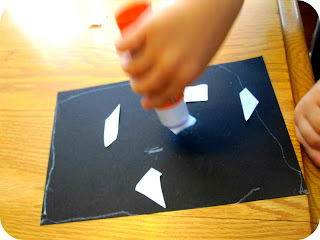 Instead of worrying about making theirs look any specific way, I let them explore and create and then during naptime later in the day I made my own product. We were all satisfied and my need to create was satisfied! My friend Kathren created her own little ghosty with her 2 year-old this morning, so if you want a scissor-free version, check out her post here. I am doing this tomorrow! Love it! How did you do the ghosts for your front lawn? I would love to do something to spruce up my front yard and make it more festive. My scare crow died last night. Literally, keeled over and died -last head in the dirt. Poor scare crow. Kathy- I took all of my Safeway plastic bags that are stuffed under my sink and stuffed them full of old artwork and crumpled scrap paper. Then I tied the bags together and stuck them on the ends of some dowels (got them at Michaels for $1/1.50 each). Then I put trash compactor bags on top of the head (they are longer than tall kitchen bags), pulled them over and down and then tied a bow around the neck with a ribbon. Then I just stuck them into the lawn. They only took maybe 30-40minutes total to make. Love them! So sad about your scarecrow!! :) Definitely try the ghosts!! This looks like fun. I know my girls love to cut everything and anything. They would love to do this. I love the lawn ghosts also! What lovely ghosts you have at your house. 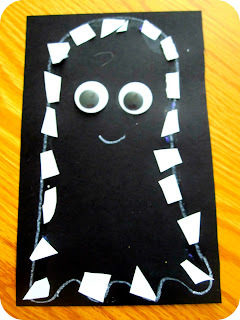 I love "non scary" Halloween crafts and yours are adorable! I like all the ghosts here. I love the ones you made and that it inspired your boys to makes some of their own. Awesome!